The recordings featured in this set are taken from a weekend of concerts held at London’s Milton Court in February 2015. 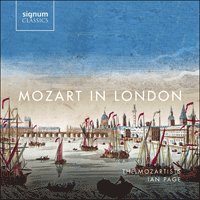 This ‘Mozart in London’ festival was one of the flagship projects in the first year of conductor Ian Page’s ground-breaking MOZART 250 series, and represented the first ever extensive retrospective of the music that was being written and performed in London during Mozart’s childhood stay in the English capital. MOZART 250 is an ambitious 27-year project which seeks to retread the steps of musical history and explore the trajectory of Mozart’s life, music and influences in chronological sequence. Each year Ian Page and his ensemble are devoting part of their programme to an exploration of the music that was being composed by Mozart and his contemporaries exactly 250 years previously. The series will incorporate historically informed performances of all Mozart’s significant vocal and orchestral works, including all his operas and concert arias and most of his symphonies and concertos, each performed during the year of its 250th anniversary. It will also explore the music being written by Mozart’s contemporaries—not only those works which inspired and influenced him but also those with which he was probably not familiar but which nevertheless represent significant landmarks or intriguing byways along the path of musical history during Mozart’s lifetime. MOZART 250 was launched in January 2015, and will continue until 2041, the 250th anniversary of Mozart’s death. Wolfgang Amadeus Mozart arrived in London with his father, mother and sister on 23 April 1764, and remained there for fifteen months. During this period he gave numerous public concerts in addition to three private performances for King George III and Queen Charlotte, and he was exposed to a wide variety of other people’s music, some of which (unsurprisingly) had an important effect on the evolution of his own compositional style. It was while he was in London that Mozart composed his first symphonies and his first aria. The London to which he came was of course vastly different from the modern city. It was the largest, busiest and wealthiest city in the world, and the recent 1761 Westminster Paving Act, which provided street lamps that burned throughout the night, merely added to the impression of a metropolis that never slept. It was the London of Dr Johnson and Horace Walpole, of David Garrick and Pitt the Elder. Handel, who lived in London for the last forty-seven years of his life, had died only five years previously, and Hogarth passed away during the Mozarts’ stay. Only two bridges—London and Westminster—spanned the Thames (Blackfriars Bridge was under construction but was not opened to the public until 1766), and Buckingham Palace (or Buckingham House, as it was then called), had been built by the Duke of Buckingham as recently as 1703, and had only been bought by the Crown in 1720. Mozart’s father, Leopold, was a violinist and composer at the court of the Archbishop of Salzburg, but his name was known beyond Salzburg and Augsburg (the town of his birth) only as a result of his highly regarded treatise on the art of violin-playing, which had been published in 1756. In 1747 he had married Maria Anna Pertl, who bore him seven children; of these only the fourth, Nannerl, and the last, Wolfgang, survived infancy. Leopold soon realised that both these children had exceptional gifts, and he started to devote all his energies and spare time to their musical education—a task for which he was eminently qualified. Following a highly successful visit to Munich and Vienna—where the children played for the Empress Maria Theresia at Schönbrunn Palace—Leopold and his family set off on a Grand Tour, departing from Salzburg on 9 June 1763. Their ensuing itinerary included Munich (again), Augsburg, Ludwigsburg, Schwetzingen, Mannheim, Mainz, Frankfurt, Cologne, Brussels and Paris, where they stayed for six months (including a fortnight at Versailles).They had not originally intended to travel any further north but, in Leopold’s own words, 'everyone, even in Paris, urged us to go to London'. They left Paris on 10 April 1764, arriving in Calais on 19 April. It was the first time that they had seen the sea. The crossing to Dover, in a small chartered boat which they shared with four other passengers, was a torrid affair—in a letter to his landlord in Salzburg Leopold wrote: 'Thank God we have safely crossed the Channel. Yet we have not done so without making a heavy contribution in vomiting'—and after spending one night in Dover they finally arrived in London on 23 April. Mozart’s father was forty-four, his mother forty-three, and his sister Nannerl (whom many considered to be an even finer keyboard player than her brother) twelve. Wolfgang was eight. In England there is a kind of native complaint, which is called a ‘cold’. That is why you hardly ever see the people here wearing summer clothes. In the case of those whose constitution is not strong, this so-called ‘cold’ becomes so dangerous that in many cases it develops into a ‘consumption’, as they call it here … and the wisest course of action for such people to take is to leave England altogether and to cross the sea. Indeed, many cases can be found of people recovering their health on leaving this country. Leopold’s own prescription was not quite so drastic, but he was advised to withdraw to the cleaner air of the countryside. As a result the Mozart family moved to Chelsea on 6 August, to a house belonging to a Dr Randal in Five-Fields Row (now 180 Ebury Street). It seems hard to believe now that this location was sufficiently removed from the city to have the desired effect, but the street-name suggests that the area was far more rural in the 1760s than it is now. It was here that Mozart composed his first symphony, and the family remained there until late September, when they returned to the centre of town, taking up lodgings at the house of Mr Thomas Williamson, corset-maker, at 15 Thrift Street (on the site of what is now 20 Frith Street). The Mozart children performed for the third and final time at Buckingham House on 25 October, the fourth anniversary of the King’s accession to the throne, and Wolfgang subsequently composed a set of six keyboard sonatas (with optional parts for violin and cello), which were completed on 18 January 1765, published on 20 March, and dedicated to Queen Charlotte. The artistic and social whirl of the city was now in full swing too, and there were numerous opportunities for the children to continue their unique education. They visited many of London’s most celebrated landmarks, including Westminster Abbey, St Paul’s Cathedral, the Foundling Hospital, the Royal Observatory at Greenwich and the recently founded Royal Botanical Gardens at Kew. At the Tower of London, whose menagerie housed various exotic animals, Wolfgang was terrified by the roaring of the lions, while Nannerl was bemused by 'a donkey with coffee-coloured stripes' (in reality a zebra). They met composers such as Johann Christian Bach (with whom Mozart formed a lasting bond), Karl Friedrich Abel, Thomas Arne and his son Michael, Samuel Arnold, George Rush and Mattia Vento, singers such as Giovanni Manzuoli (who is thought to have given the young Wolfgang singing lessons), Ferdinando Tenducci, Teresa Scotti, Ercole Ciprandi and Charlotte Brent, and various counts, duchesses and other aristocrats. This last category included Lady Clive, at whose home Wolfgang and Nannerl gave a recital in March 1765; it was in this same house that her husband, Lord Clive of India, was to commit suicide ten years later. More important than any of these visits and meetings, however, was the vast array of music that the young Mozart was discovering—at the theatres at Covent Garden, Drury Lane and the Haymarket, at the Pleasure Gardens at Ranelagh, Vauxhall and Marylebone, and at the newly launched Bach-Abel concert series and various other house concerts. He was also developing rapidly as a composer in his own right, and a concert which he and his sister gave at the Little Theatre on the Haymarket on 21 February advertised that 'all the Overtures [a term which at the time was interchangeable with ‘symphonies’] will be from the Composition of these astonishing Composers, only eight Years old'. The use of the plural was probably a mistake—certainly no compositions credited to Nannerl have survived, and an advertisement for the Mozart’s final public concert in London, which took place at Hickford’s Great Room in Brewer Street on 13 May 1765, promised 'all the OVERTURES of this little Boy’s own Composition'. Leopold Mozart seems to have overestimated the potential to make money, though, in a city where so many other highly capable musicians were trying to do the same thing. Unlike in the other musical centres with which he was familiar, the musical scene in London was based on commercial entrepreneurship rather than courtly favour, and as such the market-place was overcrowded. With the lengthy and expensive return journey to Salzburg looming, and wealthy interest in his children’s remarkable talents waning, Leopold resorted to increasingly desperate means of earning money. Between April and June visitors were invited to call on the Mozarts’ lodgings in Thrift (Frith) Street, where for five shillings they could have the chance to put Wolfgang’s talents 'to a more Particular Proof, by giving him any Thing to play at Sight', and by July, when he rented a room at the Swan and Hoop tavern in Cornhill (then, as now, in the financial centre of the city), the price for hearing the children perform had dropped to two shillings and sixpence. A far more thorough and reputable examination of Wolfgang’s prodigious gifts was carried out by the Honourable Daines Barrington, an esteemed scientist, lawyer and music lover, who in 1769 submitted his findings to the Royal Society in London. This report has become one of the most valuable documents relating to Mozart’s uniquely precocious gifts. Another important event from the Mozarts’ final weeks in England was their visit to the British Museum. Children were officially prohibited, but Wolfgang was invited to present to the museum printed copies of the sonatas dedicated to Queen Charlotte (K10-15), a family portrait and one of his musical manuscripts—this was a short unaccompanied anthem, God is our refuge, K20, which proved to be his only full setting of the English language. The Mozarts left London on 24 July 1765, travelling to Canterbury and staying for several days at the nearby Bourne Place as guests of a certain Horace Mann. From there they proceeded to Dover, and at ten o’clock on the morning of 1 August they set sail for Calais. Although Wolfgang maintained a lifelong allegiance to England—in a letter of 1782 he described himself as an 'out-and-out Englishman'—he was never to return. I am now in a spot outside the town, where I have been carried in a sedan-chair in order to develop a stronger appetite and renewed strength from the clean air. It has one of the most beautiful views in the world. Wherever I turn my eyes I see only countryside, and in the distance the finest castles, and the house in which I am living has a lovely garden. The one drawback of this idyllic setting was that Wolfgang and Nannerl, on account of their father’s grave illness, were not allowed to make any noise, not even music. Nannerl was to recall in her memoirs many years later that 'our father lay dangerously ill; we were forbidden to touch the keyboard, and so, in order to occupy himself, Mozart composed his first symphony with all the instruments of the orchestra, especially trumpets and timpani'. Whether the work described by Nannerl is the symphony K16 is debatable (it does not call for trumpets or drums), but it is at any rate the first of Mozart’s symphonies to survive, and it certainly constitutes an auspicious arrival on the compositional scene for the young prodigy. In London he had already encountered an extremely cosmopolitan group of composers, headed by two Germans, Karl Friedrich Abel and Johann Christian Bach (son of the great Johann Sebastian), and the first symphony, which was probably first performed at a concert given by Wolfgang and Nannerl at the Little Theatre, Haymarket on 21 February 1765, shows how completely the young Mozart was able to assimilate and recreate each of the styles with which he came into contact. Like the symphonies of Abel and Bach, it has three short movements (fast, slow, fast), and it captures the early symphonic vocabulary—alternations of loud and soft, tremolos, rapid scales—with remarkable confidence. Yet in the ethereal suspensions that immediately follow the opening unison fanfare there is already an originality and otherworldly beauty in the music, as well as the sense of an impetuous youth testing how far he can push and challenge the rules he has been taught. In the second movement, which similarly plays with texture and colour rather more than with melody, the first horn plays the same four-note pattern that twenty-four years later was to open the last movement of Mozart’s final symphony, the ‘Jupiter’; much significance has been made of this, but it is surely no more than a tidy coincidence. The work concludes with a short but ebullient finale in which cascading violins and braying horns dominate. Some of the writing for second violins in particular is surprisingly taxing, and a brief unison figure in the strings explores chromaticism which would doubtless have raised a few eyebrows among early audiences. On the whole, however, this is an astonishingly accomplished and assured début, and the listener quickly forgets that this is the work of an eight-year-old—indeed no adjustment of expectation is required. The Mozarts’ concert that eventually took place at the Little Theatre, Haymarket on 21 February 1765 had originally been scheduled for 15 February, but it was postponed on account of a performance being given that evening at the King’s Theatre, Haymarket of Thomas Arne’s oratorio Judith. This work had first been performed at a Lenten concert at the Theatre Royal, Drury Lane on Friday 27 February 1761, and the cast had comprised several of the luminaries of the London musical scene with whom Mozart would subsequently come into contact; these included the celebrated castrato Ferdinando Tenducci (whose participation had been in some doubt because his renowned profligacy had led him to debtor’s prison; he needed to secure permission from his plaintiff to take part in the performance), the renowned socialite and former courtesan Theresa Cornelys, who from 1765 was to host the fashionable Bach-Abel subscription concerts at Carlisle House, Soho Square, and, in the title role, Arne’s mistress and muse Charlotte Brent. The libretto of Judith was written by the young Irish dramatist Isaac Bickerstaffe, who also collaborated with Arne on Thomas and Sally and Love in a Village. The plot is based on a story from the apocryphal Book of Judith, chapters 7-15, in which Judith liberates the besieged city of Bethulia from its Assyrian aggressors by courageously entering the enemy camp and beheading their general, Holofernes. Bickerstaffe may well have been familiar with Metastasio’s libretto based on the same story, La Betulia liberata, which had also been set by Reutter (Vienna, 1734), Jommelli (Venice, 1743), Bernasconi (Munich, 1754) and Holzbauer (Mannheim, 1760), and it is worth noting that Mozart himself was to set Metastasio’s text in 1771, perhaps recalling Arne’s London oratorio. Judith’s 'Sleep, gentle cherub!' comes towards the end of the second of the oratorio’s three parts, as the heroine is lulling Holofernes to sleep before finally executing him, and it belongs to the tradition of bewitching ‘sleep’ arias typified most famously, perhaps, by Handel’s 'O sleep, why dost thou leave me?' from Semele. Arne reveals himself to be a master at evoking mood and atmosphere, the walking bass-line underpinning a serenely unfolding web of harmony. 'O torment great' is the oratorio’s opening aria, and is assigned in the libretto to an unspecified Israelite woman, although in practice it was written for and performed by Charlotte Brent, who was also singing the title role. This serves to establish Judith’s horror and frustration at the siege of Bethulia, and the text is full of references to both metaphorical and literal thirst (Holofernes’ first act of aggression has been to cut off the city’s water supply). The aria successfully captures this vehemence and desperation, with scurrying violins and wailing oboes reinforcing the sense of oppression, while the contrasting middle section depicts the slow drops of longed-for water. Thomas Arne’s Artaxerxes was one of the most important and successful of all English operas. It remained in the London repertoire almost continuously from its première in 1762 until the 1830s, and received a documented one hundred and eleven performances before 1790. Haydn later became acquainted with the work, reportedly saying that he 'had no idea we had such an opera in the English language', and Mozart almost certainly saw the opera while he was in London—it was revived at the Theatre Royal in April and May 1764 and January, March, April and May 1765. Arne was born in Covent Garden on 12 March 1710, and was to spend the vast majority of his life and career within the same square mile of the city centre. He is best known today as the composer of Rule, Britannia!, but his output was immense. Between 1733 and 1776 he wrote music for about ninety stage works, including plays, masques, pantomimes, and opera. Many of his dramatic scores are now lost, mostly in the disastrous fire at Covent Garden in 1808, and indeed the original manuscript of Artaxerxes was also burnt in this fire; the overture, arias and duets had already been published, and so survive intact, but the finale and all the recitatives were lost. Artaxerxes represented a deliberate attempt to create an all-sung, Italian-style opera in the English language, and Arne himself was responsible for translating and adapting Metastasio’s hugely popular libretto for Artaserse, which had already been set fifty times, including by Gluck (Milan, 1741) and J C Bach (Turin, 1760). The opera was premièred at the Theatre Royal, Covent Garden on 2 February 1762. As with Judith the previous year, the cast was headed by Charlotte Brent as Mandane and Ferdinando Tenducci as Arbaces, with the role of Artabanes being created by the celebrated English tenor John Beard; he had previously sung many leading roles in Handel’s operas and oratorios, and was also by now the manager of the Covent Garden Theatre. These three soloists all retained their roles when Artaxerxes was revived during Mozart’s time in London, and it is interesting to note that after he left London Mozart’s first three concert arias (K23, 78 and 79) were all settings of texts from Metastasio’s original libretto of Artaserse. The opera is set in Persia in 465 BC. Arbaces is in love with Mandane, the daughter of King Xerxes, as a result of which he has been banished from the kingdom (the union was deemed to be unsuitable). At the start of the opera, Arbaces is accosted by his father Artabanes, who informs him that he has just assassinated the king and begs him to dispose of the incriminating murder weapon. Arbaces is horrified, particularly when he learns that Artabanes has carried out the deed on his account, and in 'Amid a thousand racking woes' he gives expression to his sense of shock and foreboding in an aria of tremendous visceral energy and vibrancy. Arbaces, however, is soon caught in possession of the incriminating murder weapon. Refusing to implicate his father, he resorts to silence, but when even his beloved Mandane starts to doubt his innocence he laments his sad plight. In 'O too lovely, too unkind', divided violas and pizzicato violins and bass weave a magical spell which must surely have impressed the young Mozart. Johann Christian Bach, whom Mozart met and befriended in London, was to prove arguably the most significant influence on the development of the young composer’s compositional style. The youngest, and in his time by far the most famous of the sons of the great Johann Sebastian Bach, Johann Christian had moved to Berlin following his father’s death to live and study with his brother Carl Philipp Emanuel, but four years later he had moved to Italy, where he studied with the celebrated pedagogue Padre Martini in Bologna. In 1760 he had been appointed organist at Milan Cathedral, but in 1762 he had successfully applied for leave of absence to travel to London, where he had been commissioned to write two new Italian operas for the King’s Theatre, Haymarket. He was never to return to Italy, and spent virtually the rest of his life in England. The King’s Theatre, Haymarket was London’s principal venue for Italian opera from 1708 until the 1840s, and it would have been his experiences in this theatre that led Samuel Johnson to form his famous definition of opera as 'an exotic and irrational entertainment'. Originally built by Sir John Vanbrugh, and opened in April 1705, it was called the Queen’s Theatre until the death of Queen Anne in 1714, and between 1711 and 1738 Handel wrote many of his greatest operas for this theatre, including Rinaldo, Giulio Cesare, Rodelinda, Orlando and Serse. 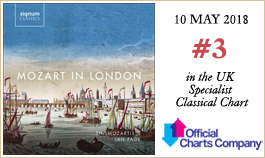 In the 1750s and early 1760s the venue struggled financially, but the arrival of Johann Christian Bach, who was commissioned to write Orione and Zanaida for the theatre in 1763, led to a period of greater stability, and when Mozart came to London it had a resident Italian company comprising some of the leading singers of the day. These included the soprano Teresa Scotti and the celebrated castrati Ferdinando Tenducci and Giovanni Manzuoli. Of the seven operas that were presented during the theatre’s 1764-65 season only J C Bach’s Adriano in Siria has survived complete, and two of them—Felice Giardini’s Il re pastore and Arne’s Olimpiade—have not survived at all. The first two operas of the season were both ‘pasticcio’ operas—that is, works made up of various pieces from different composers and sources and adapted to an existing (or occasionally new) libretto; the Italian word ‘pasticcio’ literally means ‘hotch-potch’ or ‘jumble’. The first of these, Ezio, opened on 24 November 1764, and nine arias were published in a volume of ‘Favourite Arias’ from the opera, with music by Vento, Pescetti, De Majo and Galuppi as well as two arias by J C Bach. The first of these, 'Non so d’onde viene', was borrowed from Bach’s Alessandro nell’Indie, which he had written in 1762 for the Teatro San Carlo in Naples. It had originally been composed for the celebrated tenor Anton Raaff (who was subsequently to create the title role in Mozart’s Idomeneo), but in London it was sung by Ercole Ciprandi, who was a member of the King’s Theatre company from 1764 to 1766. The celebrated music historian and commentator Charles Burney reported that Ciprandi was 'very deservedly applauded and generally encored in Bach’s charming Air 'Non so d’onde viene''. For Ezio J C Bach slightly changed the aria’s orchestration and composed an entirely new ‘B’ section with different text; this was the version with which Mozart was familiar, and it clearly left an indelible mark on the young composer. In 1776, having just composed a new concert aria in Mannheim for his beloved Aloysia Weber, he wrote to his father: 'I have set to music the aria 'Non so d’onde viene', which has been so beautifully composed by Bach. Just because I know Bach’s setting so well and like it so much, and because it is always ringing in my ears, I wished to try to see whether in spite of this I could not write an aria totally unlike his.' This letter serves as a telling indication of how influential Mozart’s time in London was, for it is unlikely that he subsequently heard a performance of Bach’s aria elsewhere. When the Austrian musicologist, writer, composer, publisher and botanist Ludwig Ritter von Köchel made his comprehensive catalogue of Mozart’s complete works in 1862, he listed as Symphonies Nos 2 and 3 two works which we now know were not composed by Mozart at all—‘No 2’ was a symphony in B flat major which had been stored in the archives of the Lambach Monastery in Upper Austria under the name of ‘Mozart’ (this is now supposed to have been the work of Mozart’s father, Leopold), while ‘No 3’ was a symphony by Karl Friedrich Abel with which Mozart had become acquainted while he was in London; he had been so impressed with the piece that he wrote out a fair copy (hence Köchel’s assumption that it was Mozart’s own composition). Rather confusingly, Mozart’s second surviving symphony is therefore still known today as his Symphony No 4. This and the Symphony in F, K19a, both date from 1765 and, although we have no categorical proof, it seems highly likely that they were composed before Mozart left London in July. K19 closely follows the three-movement prototype which characterises the symphonies by J C Bach and Abel that were current in London at the time (it would be a mistake, incidentally, to ascribe any individual significance to the fact that Mozart’s final symphonies were three times the length of his earliest ones; this is purely a reflection of the general and uniquely rapid evolution of the genre across this quarter of a century). An opening unison fanfare introduces a vivacious allegro which is redolent of the bustling city life that the Mozarts were savouring. This is followed by an elegant andante in G major, scored for strings and horns, and the work is rounded off by a lively presto, crammed full with bustling vigour and high spirits. Ezio, the ‘pasticcio’ opera which opened the Italian opera season at the King’s Theatre, Haymarket on 24 November 1764, was based on one of Metastasio’s most popular and well-known texts. The very nature of ‘pasticcio’ operas meant that only the basic skeleton (specifically the recitatives) of the original libretto was retained, but the inclusion of arias whose texts originally belonged in a different setting and context was not as great a problem as it might initially seem, given how generalised and stereotypical many of these aria texts were. Giovanni Manzuoli, the celebrated castrato who was singing the title role, was a particular admirer of the Venetian composer Giovanni Battista Pescetti, and it was presumably his decision to include in Ezio an aria by Pescetti for him to sing. Born in the first decade of the eighteenth century, Pescetti had actually come to London in 1736, replacing Nicola Porpora as director of the Opera of the Nobility, the company which had been set up in direct competition to Handel (it was Porpora, incidentally, who had first set Metastasio’s Ezio, in 1728, and Handel premièred his own setting of the libretto in London four years later). He enjoyed some success in London, and Charles Burney wrote that 'though he never had much fire or fertility of invention [he] was a very elegant and judicious writer for the voice'. After his company was forced to move to a smaller theatre and shrink its budgets he was reduced to arranging ‘pasticcio’ operas, and around 1745 he returned to Venice, where he died in 1766. His aria 'Caro mio bene, addio' was sung by Manzuoli in Act 2, scene 5 of Ezio, and the young Mozart was certainly familiar with the aria—his father brought a handwritten copy of it back home to Salzburg, where it remained in his library. The Roman Emperor Valentinian III has wrongly accused his illustrious general Ezio (conqueror of Attila the Hun) of attempting to assassinate him, and has now discovered that his own wife Fulvia and Ezio are in love with each other. Valentinian furiously denounces Fulvia, and orders Ezio to be dragged off to suffer his malicious vengeance. Before being led away, Ezio bids an anguished but stoical farewell to his beloved Fulvia. This F major symphony counts among both the oldest and the newest works in Mozart’s output; oldest because it was one of Mozart’s earliest compositions, written in 1765, and newest because the music was for a long time thought to be lost, and was only rediscovered as recently as 1981. It was known to have existed, because its opening few bars had been notated on the wrapper of another early Mozart manuscript, and it was also assumed from its inclusion in an early nineteenth-century manuscript catalogue that it was a completed work rather than a fragment. The music only came to light, though, when a set of parts (written in the hand of Mozart’s father) was found among some private documents in Munich in February 1981. Although the work cannot be dated exactly, it seems likely that it would have been performed at one of Mozart’s public concerts in London held on 21 February and 11 March 1765. The final production of the 1764-65 Italian opera season at the King’s Theatre, Haymarket was another ‘pasticcio’ opera, Solimano. The plot concerns romantic intrigue and treachery during the ancient war between Turkey and Persia, but only five arias, all of which had been lifted from existing works, have survived—by Vento, Pescetti, De Majo, Pergolesi and Perez. Davide Perez was born in Naples, to parents of Spanish descent, in 1711. Having spent his early career in Italy, he moved in 1752 to Lisbon, where he became Kapellmeister to King José I, and where he worked with the celebrated castrato Manzuoli. He came to London in 1755 for a ‘pasticcio’ of Ezio to which he had contributed some arias, but he soon returned to Lisbon, where he died in 1778. It was presumably Manzuoli’s decision to incorporate 'Se non ti moro a lato' into Solimano. This noble, tender aria is actually a setting of text from Metastasio’s Adriano in Siria, which had been presented at the King’s Theatre just four months previously in J C Bach’s setting. Karl Friedrich Abel was born in Köthen—forty-five miles north of Leipzig—on 22 December 1723. He initially studied the viola da gamba—an instrument of which he became a leading exponent—with his father, who had been a chamber violinist and viol player in Köthen when Johann Sebastian Bach was appointed Kapellmeister there in 1717. Following his father’s death in 1737, Karl Friedrich went to study in Leipzig, perhaps maintaining the link there with the Bach family, and by 1743 he was a viol player in the court orchestra in Dresden under Hasse. During the 1758-59 season he went to London, and he gave his first public concert there on 5 April 1759, just nine days before the death of Handel. Apart from a brief return to Germany in the early 1780s, Abel was to remain in London until his death in 1787, and in 1760 he was granted a royal privilege for the publication of his music in London. His association with Johann Christian Bach began in 1763, and continued the friendship that had existed between their two fathers. They gave their first concert together on 29 February 1764, and at around that time they were both appointed chamber musicians to Queen Charlotte, posts they were to hold until their deaths. They also befriended the Mozart family during their visit to London, and served as mentors to the young Wolfgang.